My daughter Amber was given a circa-1970s vintage Lervad workbench, which would be perfect for her marquetry work when she leaves university. Unfortunately it had issues from being kept in damp conditions and as it transpired, a full day's work for me rebuilding it! The solid front sections of beech (Fagus sylvatica) had split open and needed to be run over the tablesaw to separate them. The other boards were a mixture of ply and veneered chipboard, which had developed twists of their own. The mould had to be scraped off first and all the surfaces cleaned before starting anything else. 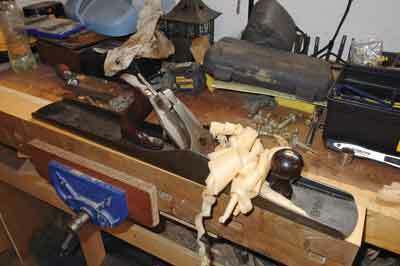 The tail vice was also removed for cleaning and regreasing. 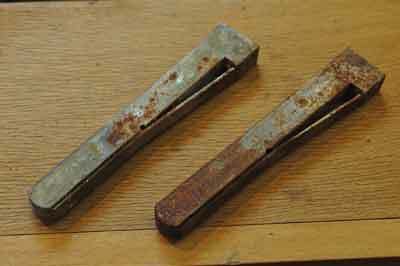 The bench dogs were in a rusty state and I decided to use electrolysis to clean them up using a car battery charger and a container full of water and caustic soda. 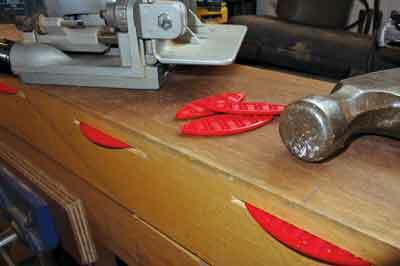 I used the technique described in issue 82 to clean the rust off a plane body - watching the fluid fizz and the rusty muck falling away is fascinating. Afterwards, I applied a heavy dose of WD40 to prevent rust forming again. 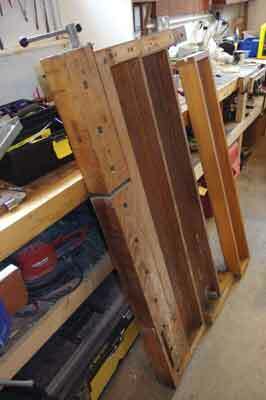 While the electrolysis was working, I had to plane the front beech bench sections flat and true. I have a cabinet in our front room at home full of sharp ready-to-go hand planes that look good but also work as well. I decided the monster No.8 was the one 'man enough' to do this particular job and it was remarkably easy to use with plenty of weight carry through each planing stroke. 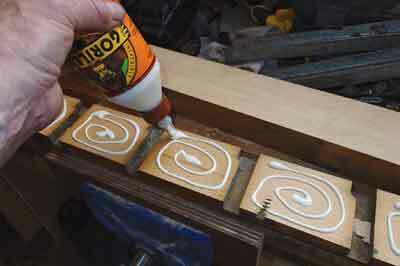 Each face had to mate perfectly for a good tight glue joint of course. The two rear bench sections made from veneered chipboard and ply framed in solid beech needed persuasion to fit flush with the front solid beech top. 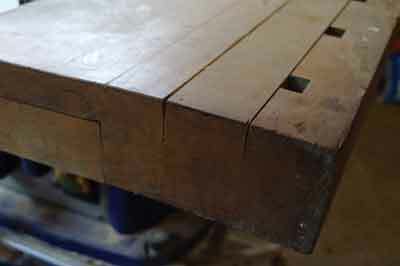 I used biscuit slots and Lamello assembly biscuits to give solid reliable connection between all the bench boards. The rearmost section can be turned upside down from a tool well to a solid surface and this was the face I chose as it is more use than as a tool well. At last, after a day's hard work, the bench was complete and the top belt sanded and varnished. 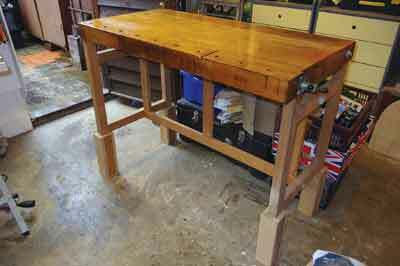 Amber specified stilts to raise the bench top to 940mm high as she works standing up. The top still has a bow due to all the separate sections so the last job will be bolting angle iron sections underneath to pull it flat again.